Java moss is one of the easiest to grow, and hardy, aquarium plants around. 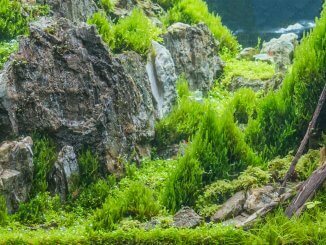 Due to its low requirements regarding water quality and lighting, it is perhaps the most common moss amongst freshwater aquarists and is widely available both in shops and online. It is commonly used for aquascaping and can produce beautiful results. It also has many other benefits such as providing protection for eggs and fry, improving tank health and providing food for breeding fish. Get Your Free eBook: Download our Java Moss ebook and learn all about how to care for and grow this aquarium plant. Is Java Moss Suitable for your Aquarium? Moss provides a natural, aging look and can give life to a bare and plain tank. Java moss is relatively easy to install, grow and maintain and it’s almost impossible to kill it. 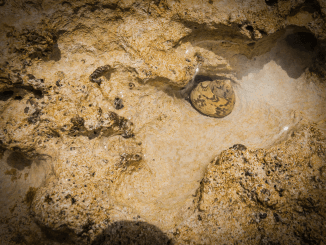 It will attach itself to many different surfaces including gravel, driftwood, rocks and commercial decorations. It’s a delicate moss which has irregular small branched stems. The stems are covered in tiny, 2mm long oval-shaped leaves which overlap. Java moss that grows under water has bright green leaves that are much smaller than the leaves that grow on land. It uses rhizoids to attach itself to surfaces, however unlike roots, their purpose is only to attach them to an object rather than provide it with nutrients. Because it has no real roots, Java moss mostly absorbs nutrients through its stems and leaves. Interestingly, there is still some confusion over Java’s scientific name, it was formally identified as Vesicularia Dubyana but has recently been reclassified as Taxiphyllum Barbieri. There is still debate surrounding the accuracy of the change. Most of the name confusion stems from Latin names being incorrectly matched with common names. For example, Vesicularia dubyana (also known as Christmas moss or Singapore moss) is extremely different to Taxiphyllum Barbieri (Java moss), although they still belong to the same Taxiphyllum genus. Always try to use the Latin name when you’re buying plants to avoid any confusion. Java moss is used by freshwater aquarists for many different reasons. It can be used to soften harsh features in the aquarium. For example, cover the wall or floor, or even cover the filter to make it look attractive. Moss provides your tank with a more natural feel – if you ever walk through a damp forest you’re highly likely to find moss growing on most surfaces, especially if there is a stream or river nearby. Possibly the most popular use of java moss is Aquascaping. Aquascaping is the craft of arranging aquatic plants, driftwood, stones and rocks in beautiful way. Much like gardening, but underwater. Another popular place you’ll see java moss is in breeder tanks. Moss creates the ideal place for eggs to attach to, and for fry to hide in from larger fish. Not only does it provide fry with shelter, but java moss also creates an ideal place to harbor infusorians, which is the perfect first food for fry. It also provides a great hiding place for shrimp and so is very common amongst shrimp tanks. Java moss is a very hardy plant and will grow in most water types. 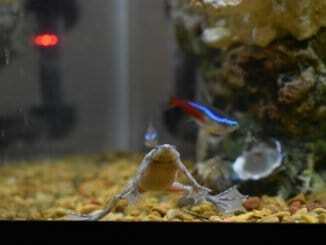 The ideal tank conditions include good water current, soft acid water and temperatures between 21-24oC. However, it will tolerate temperatures up to 30oC. The only thing to note here is that the growth rate will slow the warmer the water is. In cooler waters of around 24oC you’ll get faster growth, and a healthier looking plant. Light-wise, it will grow in both low and high light. You’ll notice a difference though depending on which lighting option you choose. Low light provides a darker and lankier plant, whereas high lighting produces a denser, compact plant. However, the higher the light level the more likely algae will grow. You might want to add CO2 and fertilization to speed growth rates up, but this plant does not require them and will grow just fine without. Java moss is compatible with almost all species of fish. Maintenance is totally your choice. 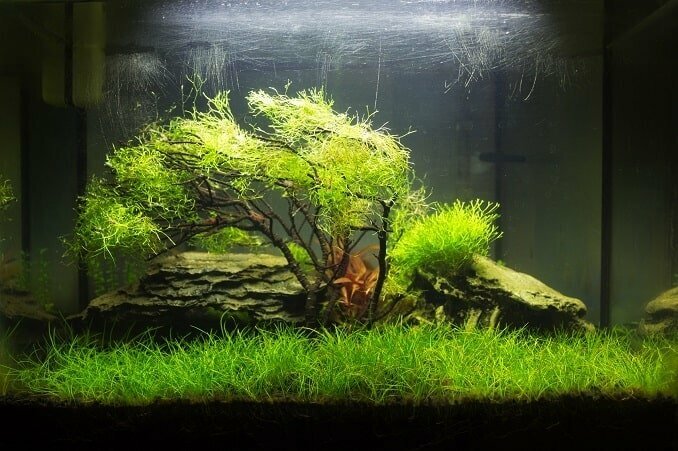 You can let your java moss grow wild, trimming only occasionally when it needs to be, or you can trim it regularly to very specific shapes. To trim you java moss, simply use a pair of scissors to keep it under control. Other than trimming, java moss doesn’t have any other specific maintenance requirements. The best advice we’ve found, to ensure your moss grows as quickly as possible, is to put it in place and then leave it – don’t touch it or attempt to move it, just trim when necessary. We’ll look at the specifics of growing your java moss in the growth section later on. We mentioned before that it can be used to cover filters – this should be done with caution as it can clog the filter if you don’t thin it out regularly enough. Likewise, it can take over your entire tank if you don’t prune it regularly. If the moss grows too thick and dense, and water can’t reach the middle sections, it can start to turn brown and dislodge from whatever it’s attached to. The real problem that java moss faces is algae growth. Algae grow quickly under excessive light and poor water conditions. If algae starts to grow in the moss it is extremely difficult to remove and usually the best solution is to remove the moss and start again. If you are adamant on trying to rescue the moss, you can try using a soft brush such as a toothbrush to gently remove the algae, just be careful you don’t pull up the moss. Some aquarists recommend different chemicals to fight algae problems, such as Seachem’s Flourish Excel. This will inevitably fix the problem temporarily, but for a long term fix – get to the route of your algae problem. Algae growths or outbreaks are usually brought on by four main factor; light, carbon (CO2), plant nutrients (macro, micro and trace elements) and poor water conditions. It’s important to keep the first three things in balance with each other to avoid outbreaks. It’s also important to remember that a small amount of algae in your tank is perfectly fine and even healthy for the ecosystem as a whole. Depending on the purpose of your java moss, there are different ways to incorporate it into your aquarium. The simplest way is to leave it as a floating plant. If you choose this option, you can literally just pop the plant into your aquarium and leave it. Most people prefer the plant to attach to something so it stays in one place. The propagation of java moss is really simple. When a piece is cut off from another, it will continue to grow and form more java moss. To attach the moss, you should lay it in a thin layer over the rock or driftwood that you want to attach it to, and secure it with fishing line or dark thread. Once the moss has naturally attached itself, after a month or so, the thread can be removed. Another popular way to grow java moss is as a carpet or wall. This provides your tank with an aesthetically pleasing floor or wall and is easy to maintain. To create a carpet, you will need two pieces of mesh and some fishing line or thread. It’s important to make sure that all the materials you put into your tank are non-toxic. Lay down your first piece of mesh, and lightly cover it with java moss. You can cut bits off to arrange them so they sit flat, don’t worry about keeping it whole. Once you have a good coverage, place the second piece of mesh on top, and use thread to secure the two pieces together. The sandwiched Moss can then be placed into the tank and will slowly start to grow through the mesh, providing you with a visually stunning bed of moss which you can use to cover the floor or the wall. Alternatively, you can weigh the moss down, for example if you want moss on the floor, sprinkle a light layer of gravel over it. 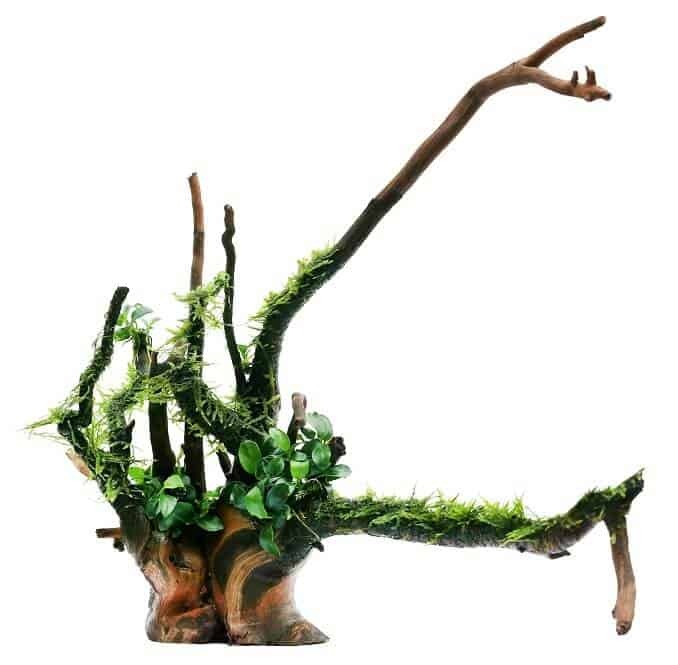 Java moss can also be used to create trees, using a piece of driftwood that stands vertically. Ideally you’ll choose a piece of wood that gives a tree like appearance with a few branches extending outwards. Alternatively, you can tie a number of pieces of wood together to form a tree shape. Remember any glue you use should suitable for aquarium use. Collect your java moss, if you’ve taken it directly from your tank, you’ll need to gently pat it off taking care not to dry the moss out. Using small amounts of glue, attach the moss to your branches in small amounts. Once you’ve attached all your moss, trim off any extra, wispy bits to create the tree shaped look. Then place the moss tree into your tank. Java moss is suitable for almost all aquariums. It has a large range of uses, from providing aesthetic beauty to a tank, to shelter for new-born fry. It is extremely easy to grow and maintain, and is perfect for both beginner aquarists and experienced aquarists alike. The most likely problem you’ll face with java moss is algae growth; it’s extremely difficult to remove. In most cases, it’s best just to start again and check your tank conditions and light level. I just discovered your site! Love all the great information! I am a retired veteran with PTSD and have found having an aquarium helps me with meditation and relaxing. I very much enjoy aquascaping the tank and watching my littler buddies along with my pups, bit even more importantly learning about each species and genre! This site has really been helpful! I was wondering if too much Java Moss is harmful? My java moss has had massive success with growing under the conditions you mentioned above, however I am wondering I should be removing some of it? I currently have it very clumped together with no signs of it dying, as it could comfortably take up a quarter of my 4-5ft tank. It just keeps growing! Very easy! Sounds like you have your tank dialed in just right, now go sell some small pieces online and put that money back into your tank system. Best info on java moss. I want to plant some and later add red cherry shrimp. 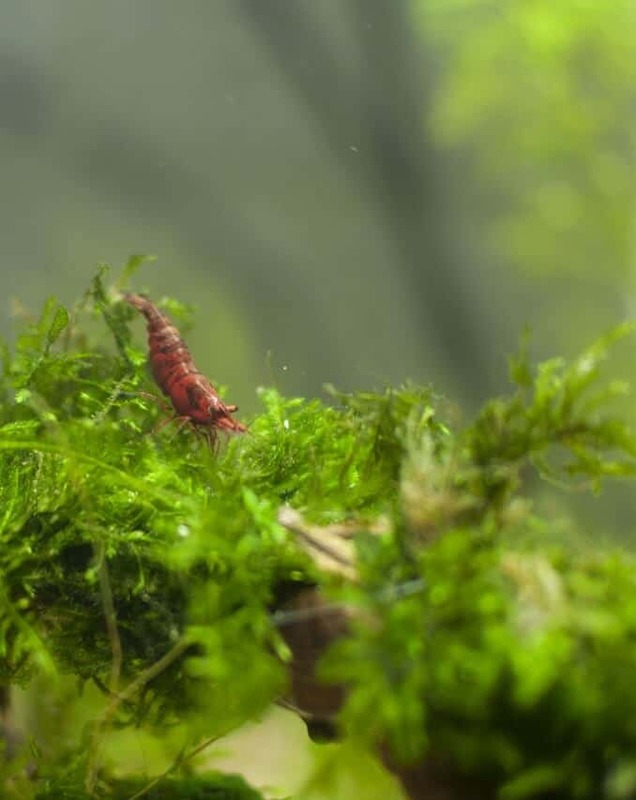 Do you ship red c shrimp outside conUS? I’m wondering if I can grow java moss in a vase like Marimo balls? Or with a beta fish with no filter? You probably could grow java moss in a vase if you change the water every couple of days and also put some kind of aquatic plant fertilizer every once in a while (if there are no other source of nutrients). However please don’t think that java moss can replace the functionality of a filter for a betta fish, that’s just plain cruel. Bettas need heated AND filtered tanks preferably no smaller than 5 gallons (or at bare minimum 3 gallons). I personally am planning to use some java moss just to assist in maintaining water quality in-between the weekly water changes but I would NEVER remove the water filter completely. If you think your betta is ok without a filter, think about how you would feel if you were locked in a bathroom (with no air vents) for example, and toilet is clogged + no plunger to unclog it and you have to breathe in all the nastiness… and you can understand how a betta fish suffers when it has to breathe in its own waste fumes. Please don’t do that to your little buddy, he/she deserves better. I grow Java moss in a 1 gallon fish bowl with a heater and no filter, the bowl has a good substrate of activated carbon, clay and gravel. there is also a moss ball, pothos ivy and golden ribbon. No fish, only shrimp and a snail. The moss grows like crazy in there. faster growth than in my proper tank. I also grow moss in a .5 gallon micro tank with no filter and no heater and no substrate beyond tiny bit of gravel. I also grow moss in my paludarium which has no heater or filter and the bottom has nothing but a thin layer of sand. I only do 1-2 water changes a month and I only replace 20-30% of the water. My tanks all have a decent amount of seed shrimp and they do an amazing job keeping the tanks clean. 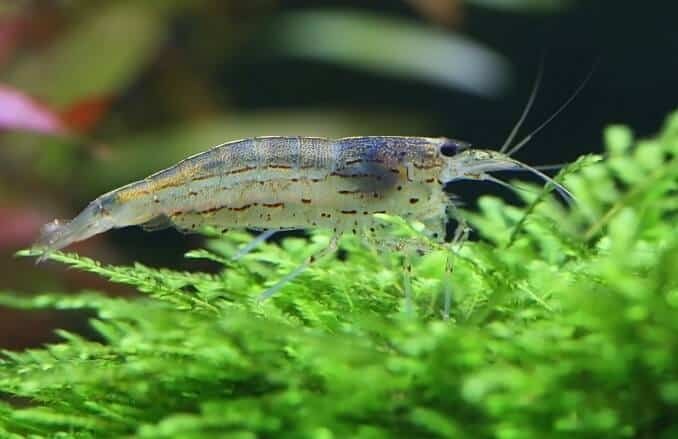 Hi, can java moss be used in a tank without water pump or fish, and changed every fortnight for example? Thank you.